Thanks for your support of the animated Hellboy. Contrary to some rumors you may have heard, there is no Hellboy TV series planned. For now, it's just the two DVD movies. Thanks for searching out this site and telling your buds about the big red guy. For updates on Guillermo's Hellboy movie, currently in production, the best place to go is DelToroFilms. Mr. G checks in from time to time with his usual barrage of cinematic enthusiasm. For the comics, you need go no farther than The Hellboy Zone of Dark Horse Comics. Big, big things coming this year. A special thanks to the rabid fans at Variant Edition.com and The Comics Factory in Pasadena, CA who always make me feel like a superstar. I also appreciate the support of Peter, Bry and all the comic geek speakers at CGS. Y'know, if you're not listening to comic podcasts, you're missing half the fun of reading comics. The Hellboy crew is now spread out working on such varied shows at Slacker Cats, Ben 10, The Batman and the new Spider-man series. I expect you'll see quality work in all those productions. As for Hellboy Animated, the future rests on sales and the whims of Hollywood. I really have run out of things to post and there's no point in just filling space. So for now, I'm out. I'll see you at the conventions and on the board at Hellboy.com. Well, I guess this is goodbye for now...Thank you for the wonderful films and I hope all projects for the future go well for you ( hopefully on of them is Hellboy Animated 3 ). Meanwhile I'll turn my attention over to the filming of HB 2: The Golden Army. Blood and Iron exclusive at best buy was amazing. The movies were great, and I hope we get one more!! Good luck with future productions! We bought a copy of B&I tonight! I'm crossing my fingers for more Hellboy Animated movies, and hope this is only "goodbye for now"! You did a great job on the two HB movies. Thanks for all of it, Tad. Thanks for all of your work on the Hellboy animated movies. I've really enjoyed them, and the extremely high production values. Thanks too, for taking such care in the production of the movies themselves. Perhaps well see you at SDCC. Thank you for the two amazing animated features. Though I discovered them late I am glad I did. I sincerely hope that there will be more Hellboy animated features like these and I hope others will follow your lead. Thank you and good in your future endeavours. My friend...thanks for all your hard work on the two animated features,they came out beautifully.I know that this was a dream project for you and hopefully sales of B & I continue that dream.This project could not have been in better hands.Thanks for the signing and sketch on Sat. I wish you all the best.as always!Take care and I hope to see and hear from you soon. Hope this isn't the end. B&I was EXCELLENT. I really hope to see Phantom Claw. Good luck in your future endevours. No Shadow of the Claw? Now I'm depressed. Thanks for the two features Tad. Hope to see more of your work soon. Hellboy: Blood & Iron was woundeful. Thanks for the films and all you guys contributed to Mignola's universe. I hope The Phantom Claw gets made even if we have to wait till August 2008 when Hellboy 2 comes out. Thanks again. I Hope that we do get to see the phantom claw eventually! 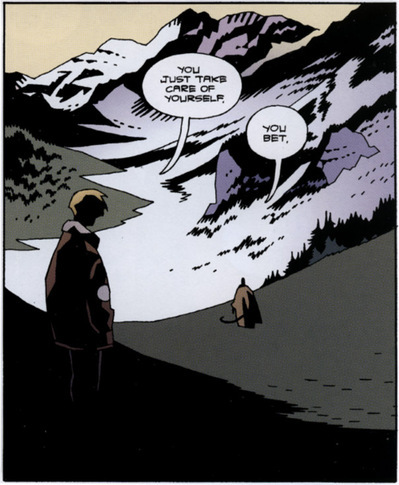 I'd like to see more of your stories of Hellboy as a kid whether they are animated or in comic form. I loved the addition to phantom limbs! Thanks for this great blog, Tad. You did a wonderful job!! You are welcome over at the DelToroFilms.com message board anytime!! wow this doesnt sound like your think there will be more? Well i bought two copies Best Buy figure(unopened),and Circuit City bust-up. Both movies are good , and second is a major step in right direction. still dont like how liz and others look like there out of the jackie chan cartoon. Also i prefer the blue flame for liz. so good luck still hoping for more. Way to go with the Emmy Nomination for SoS! Although I have only just bought and watched both DVD's, I wanted to thank members of the production team and voice artistes (including new addition Peri Gilpin) for their contribution to the project. In the movie world, nothing stands still, and franchises can be revamped (consider Batman, Superman and even TMNT). Contrary to any myth that Hellboy Animated is dead, lets hope that the 'Good Guys' will return in future.